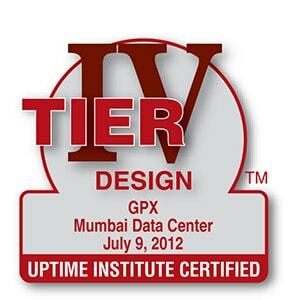 Uptime Institute Tier IV Fault Tolerance | GPX Global Systems Inc.
GPX’s Mumbai data center has been designed and built utilizing the Uptime Institute’s Tier IV Classification System for data center systems and operational sustainability. The Uptime Institute’s Tier Classification System is a distinct, separate benchmarking system. The Tier Classification System is an outcome-oriented, performance-based system for benchmarking data center availability. It is business-case driven and has not been compromised by special interest or other parameters that have little to do with the uptime associated with the computer room operations.